Please see the class schedule for new and updated times and teachers. Should I Get My 200 Hour Yoga Teacher Training? In 2017, I asked myself a lot of questions. Should I get my yoga instructor certification? Is the 200 hour yoga certification right for me? Will I have time to commit to yoga teacher training? Is the 200 hour yoga certification worth the money? Will I benefit from yoga teacher training differently than if I simply commit to taking more classes? What is the best yoga teacher training near me? Will I make money as a yoga instructor? These were only a few of my questions, and they probably sound familiar to you if you are still reading this. At the time, I was 41 years old, and a stay-at-home-mom to a 5-year old and a 3-year old. Yoga was (and still is) one of the few things that brought me peace, clarity and the ability to calmly manage the rest of my day. Yoga has helped to keep me focused and positive. Not to mention I’m stronger, more flexible, in good shape and I have noticeably better circulation since committing to a more regular yoga practice. In other words, I love yoga and what it’s done for me, both mentally and physically. But I asked myself if that was reason enough to commit that much time and money to my yoga teacher training? Was it too selfish and self-indulgent to justify? Was it going to be worth all the time that I would ultimately be away from my family? My mom asked me, “So, what are you planning to do with it once you get it? Couldn’t you just keep taking classes?” And, at the time, I didn’t have a good answer. So, my commitment waned. Then, still uncertain, I decided to at least fill out the application for the yoga teacher training program that was soon starting at Pulsation Yoga at the Arlington Heights and Lake Zurich yoga studios. I knew there was no wrong answer, but I took the opportunity to really think about it and reach deep down to understand my intentions, my goals and myself. Taking the time to articulate the answer helped to seal my decision. After writing out my answer, I submitted my application and then began my 200 hour yoga teacher training at Pulsation Yoga. And it was the best decision I could have made for myself. I not only learned about the history and philosophy of yoga, I also learned about myself. My practice got stronger. My passion grew. And I didn’t feel like it was just a hobby or just a work out. I felt like I, and everyone in my training, filled a hole we didn’t know we had. I grew confident in my practice and in myself. I felt strong, physically and mentally. I felt at peace, yet energized. Taking my yoga teacher training changed my life in a lot of ways and opened up opportunities for me both personally and, ultimately, professionally. I’ve been practicing yoga for over 10 years and have always enjoyed it as a supplement to my running, as a stand-alone workout, or, more recently, as a way to re-center, re-group and un-stress. While I’ve always focused first on the exercise aspect of yoga, I’ve recently come to appreciate the mindful side of the practice just as much. I feel like at age 41, I’m at my peak ability and I want to build on that. I feel strong, I feel flexible and I feel confident on the mat. I believe this is the right time to deepen my practice and my understanding while I am physically able and spiritually open to get the full benefit. Being a stay-at-home-mom, while very fulfilling in many ways, is at times also very difficult for me. I’ve put my own career and my own aspirations on the back burner to do what I know my family needs right now, and honestly, what I want to do for us. I have no regrets with my decision, and I hold no resentment toward my husband, who works full time, or my kids, who need me. However, I began to notice that it is also very easy as a stay-at-home-mom to put my own needs on the back burner, which I am afraid can lead to regret and resentment. So, for the past few months, I have allowed myself to take the time I need and to do the things I love without the full weight of the guilt that had previously held me back. I’m realistic about my family’s needs – my husband works full time (downtown, and late, and from home most nights), my children are young and often sick, and I have no family nearby to help. But I am also realistic about my own needs – I cannot take care of them if I do not take of myself, inside and out. My decision to move forward with yoga teacher training is one way that I have decided to take care of myself right now and down the road. As my kids get older and are both in school, I’m doubtful that I will go back to work full-time. Ideally, I’d like to have my yoga instructor certification and hopefully begin teaching some classes or workshops. Throughout my life I’ve found that when I am truly passionate about something, I want to share it. So while I know that teaching yoga classes wouldn’t necessarily elevate me financially, I do believe that teaching yoga classes would elevate me spiritually. And that something that is increasingly important to me. I’ve been coming to Pulsation Yoga in Arlington Heights since having my first child and moving from the city to the suburbs. I enjoy many different types of yoga classes, and in the past six months as I’ve considered yoga teacher training, I’ve spent time at a few different studios to understand my options and to be sure I’m choosing the right program. While I appreciate various class structures, I keep coming back to Pulsation Yoga. Every time I attend class at Pulsation Yoga, I work hard, I have an opportunity to try new things and I feel more confident and at peace. My first experience in yoga, which cemented my love for the practice, was a very similar class structure (Anusara based practice) and brought up similar feelings. Since leaving that gym 9 years ago I hadn’t been able to find a studio or class that I consistently valued for those same reasons until finding Pulsation Yoga. I often attend a Power Yoga class at my gym because it fits my schedule and my day care needs. 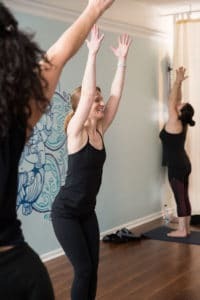 Every time I am there, I am reminded of why I stopped going to Core Power Yoga in the city – it is a great workout, and the instructors understand their specific class script, but I don’t feel like the instructors truly understand yoga. However, attending that class regularly has actually helped me become more patient, more present and more positive. I choose to show up, to work hard, and to better my practice and myself, and I appreciate learning different styles to help build my own personal style. All that said, I believe that getting my yoga teacher training at Pulsation Yoga is the right decision for me. I believe that the Anusara style and the thoughtful training and support you can provide are in depth, allowing for a much better base and a much better fit for me than other programs, and I then I can take that base and formulate my own style from there. After a year of soul searching, I feel very confident about my decision to train with Pulsation Yoga, if you’ll have me. Susan had been practicing yoga for over a decade before receiving her 200 hour yoga teacher training through Pulsation Yoga. Susan’s practice originally started as a supplement to her distance running, but over the years she realized she got much more from yoga than simply stretching and strengthening, and it has become her central focus. She emphasizes a balanced practice to build strength, stamina and peace through a flowing style suited to her students’ needs, while pushing them to their highest potential.